MPH with concentration in Healthcare Management from San Diego State University, California, USA. Mini-Residency in Geriatrics at University of California San Diego, California, USA. 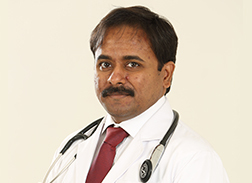 Dr. T.N.J.Rajesh has extensive experience working in the field of healthcare both in India and in the USA for more than a decade. worked extensively in MDCCU, CTICU taking care of the critically ill patients suffering from various infectious diseases at Apollo Hospital, Chennai. In USA, he worked for the Ageing and independence services, County of San Diego, California and then as a Director at Crossroads Regional Hospital, Alexandria, Louisiana. During his stay there, he was part of the senior management team and played a pivotal role in getting accreditation from The Joint Commission. He is also actively involved in research in infectious diseases with the primary area of interest being Carbapenem resistant GNB’s, Nosocomial Infections, CQI in healthcare. Dr. T. N. J. Rajesh is associated with various national and international organizations like Clinical Infectious Diseases Society of India,International society for Infectious diseases ,American College of Healthcare Executives, San Diego Organization of Healthcare Leaders. Published significant research work on the topic - “Fall Prevention in the Elderly”, Ageing and Independence services, San Diego, California, USA. “Carbapenem resistant gram - negative Bacteraemia in an Indian Intensive Care Unit : A review of the clinical profile & treatment outcome of 50 Patients”, in the Indian Journal of Critical Care Medicine, 18 (11); 750-753; November 2014.